UPDATE: Or then again, maybe we will. BEFORE: Or at least that would seem to be the wish of Peter Gelb’s Metropolitan Opera. Though ironically, his actions seem to keep the headlines, and online outrage, coming. The latest kerfuffle: according to a report by the New York Times Dan Wakin, Gelb requested, and got, the editors of Opera News to agree not to publish any further reviews about productions at the Met after feeling the sting of some not so positive remarks in the magazine about the company's much maligned new production of Wagner's Ring Cycle this spring. And thus the drum beat of why on-line arts criticism, warts and all, matters continues unabated. But there is another issue here that bears some attention. Wakin quotes Opera News Editor-in-chief F. Paul Driscoll as clarifying that only productions of the Metropolitan Opera will be excluded from the pages of the magazine while other companies can continue to expect the kind of critical coverage they produce. Now let me say that I’m not necessarily concerned so much here about this loss of coverage as some sort of censorship. To be honest, the place of Opera News in the world of opera generally has always been tepid and highly problematic with conflicts of interest. The most faithful of readers may recall that I wrote about this topic (albeit somewhat tangentially) in one of the very first posts here at Out West Arts. 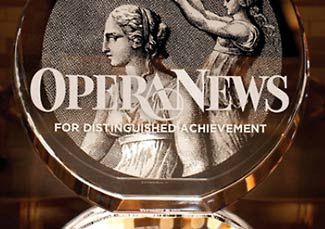 Opera News has long been first and foremost an advertising supplement for the Met Opera. It is, in fact, published by the Metropolitan Opera Guild: a support organization for the company. That Gelb would see a conflict in a support group of the organization being critical of the Met's productions makes sense to me and broaching that subject with them would make sense. But distinguishing Opera News as an advertising supplement from an in-house support organization, as opposed to an outlet of independent journalism has other implications that don’t seem to have been fully explored, at least based on what Mr. Wakin reports in the Times. Specifically, if Opera News can write critically of other opera companies’ works, but can only speak in glowing, non-critical terms of its sponsoring institution, what value does its criticism have to begin with? Under the scenario laid out in Wakin's article by the editors, Opera News is now more or less about the Met passing judgement on the world of opera while its own house is beyond question and examination. This is neither fair nor necessarily wise. Is the rest of the opera world so desperate for coverage that they need the Met’s advertising supplement to come around and bless or disapprove of them? Given the Met's recent track record, one wonders how the company, and its advertising supplement is in a position to tell anyone what kind of job they are doing. If I were in charge of a regional or major opera company, I’d think long and hard before inviting anyone to review my work on behalf of Opera News again. By eschewing work at the Met but continuing to publish reviews of other houses, the magazine and the Metropolitan Opera generally have cast a pall over their credibility if not their ethics. Or in the words of Mama Morton, whatever happened to class? But what if they love a regional production and recommend it? Let's face it, the vast majority of reviews in Opera News are generally positive. I'd think any company would love the publicity and attention. They just changed their minds after all the blowback. Well, the decision has been reversed, undoubtedly due to the outpouring of bad publicity. Gelb has really been stepping in it recently. Very embarrassing.